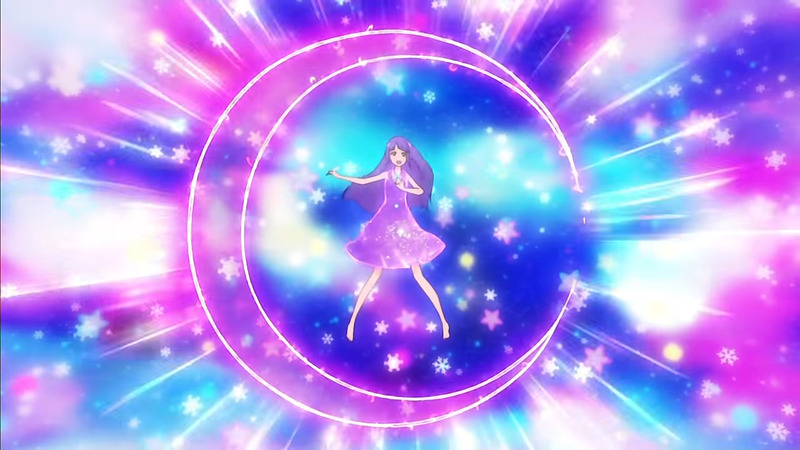 Precure as a whole is known for its fantastically animated transformation sequences, but I’ve been especially impressed by the current Star Twinkle Precure. They feel especially strong and consistent, and both the attention to detail and little design flourishes make each character stand out from the others. 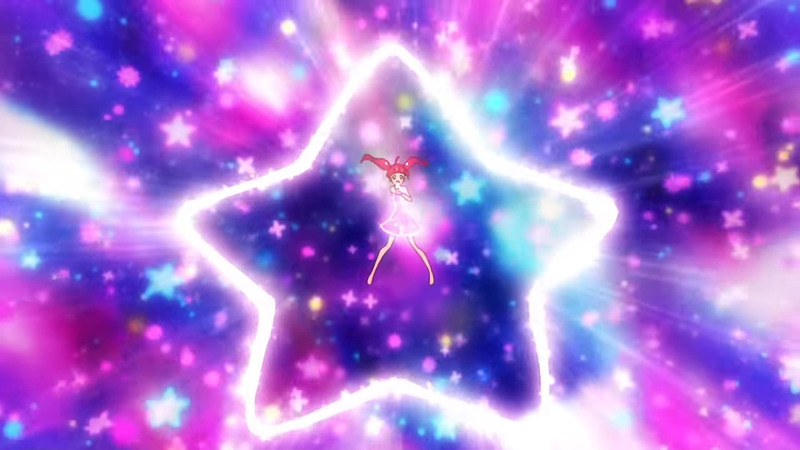 As the main character, Cure Star is the standard from which the others are contrasted. She sets up the basic premise of the series’ transformations–waving around a pen and drawing while singing about who she wants to be–but there’s also a spring and a bounce that highlights her personality in full. Her dancing feels very loose and casual, and at the same time conveys her eagerness and curiosity. 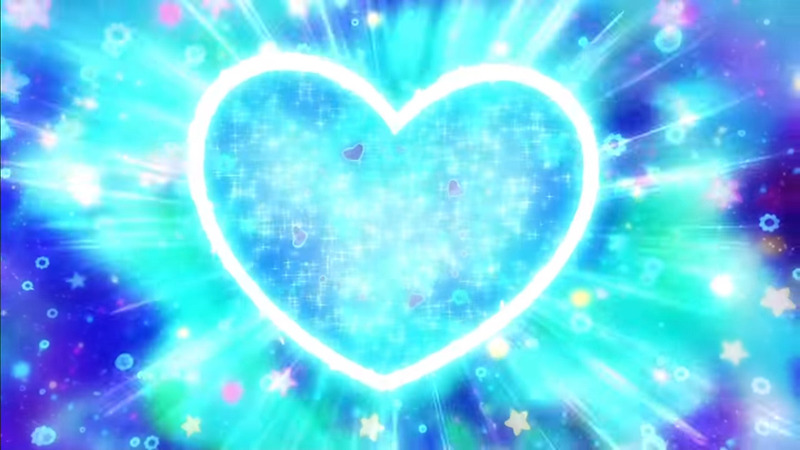 Cure Star already embraces who she is and who she wants to be in her daily life, so she doesn’t seem especially different before and after changing into a Precure. 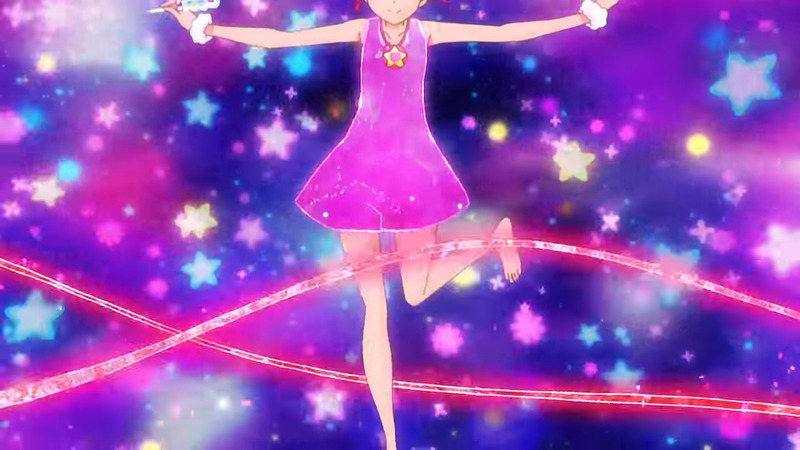 While all the other girls draw their symbol and stand next to or in it, Cure Milky stays offscreen. 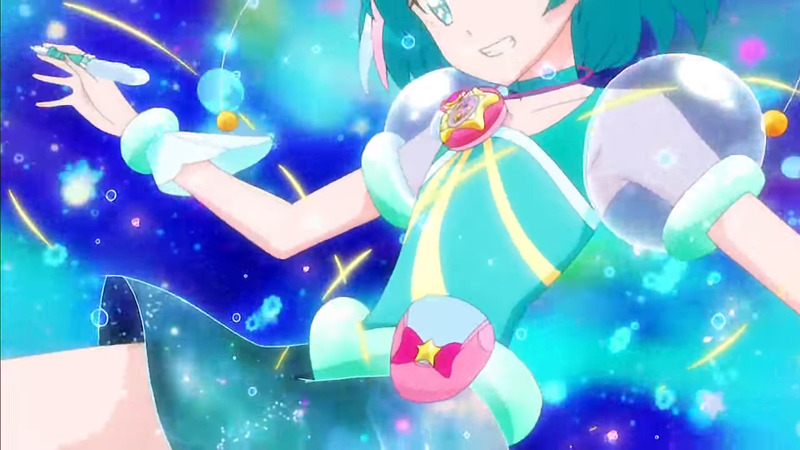 She then surfs on top of the heart along a flow of green water, playing off the Japanese word for Milky Way: ginga, or “silver river.” Milky seems to express the most joy over transforming into a Precure, which makes sense, given that she’s the only who even knew about the legend of Precure already. Her outfit has a number of elements that suggest her extraterrestrial origin, but my favorite are the clear, bubbly shoulders. They’re reminiscent of old-fashioned portrayals of aliens at the same time that they adhere to the general Precure aesthetic. 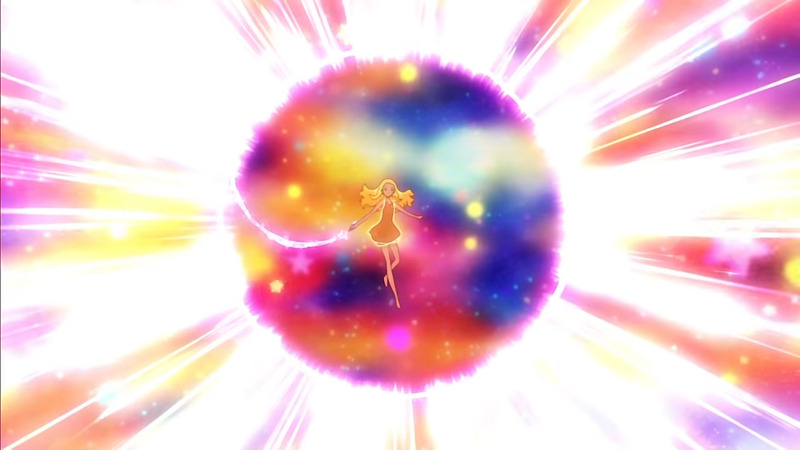 The first really noticeable thing about Cure Soleil is that as he continuously traces a circle, it gets brighter and more intense, almost like you’re staring into the sun. It’s the only initial drawn shape to create a fully rendered image (a sun, of course), which she then emerges out of, as if the flames are transforming her. 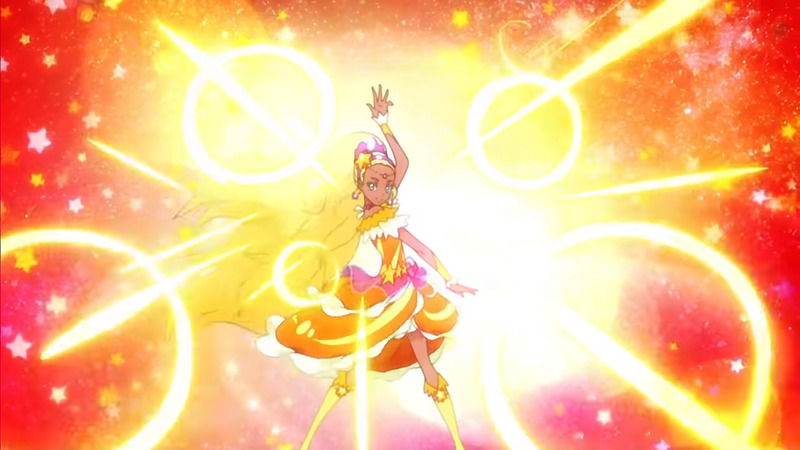 Soleil’s Precure outfit resembles a flamenco dress, calling back to her Spanish/Latin cultural background, without making her feel like a “token” foreigner character. 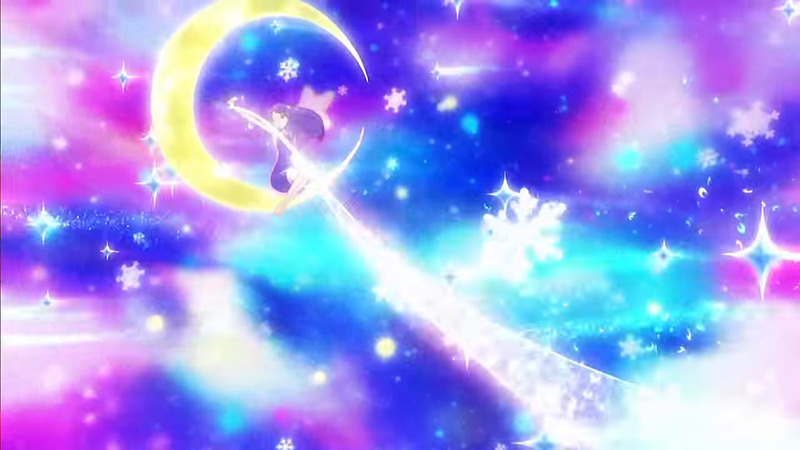 Cure Selene’s transformation whispers elegance compared to the others, which are more energetic. Her initial drawing is the only asymmetrical one, and the way she stands inside the crescent moon without being inside of the shape itself leaves an impression—especially with the way her feet are planted apart, toes in. Unlike the other girls, she actually rides the crescent moon she draws, and the arrow she shoots is based on her archery background. Her transformation feels the most “freeing,” as if she’s finally not being held back by her upper-crust upbringing. Overall, I love how much personality and individuality these transformations have. They really emphasize the idea that these girls are trying to transform into who they want to be. In 2016, I found out about Rokudou no Onna-tachi, a new manga that was a fresh and interesting take on the well-worn harem genre. As I continued, my opinion of it only grew. 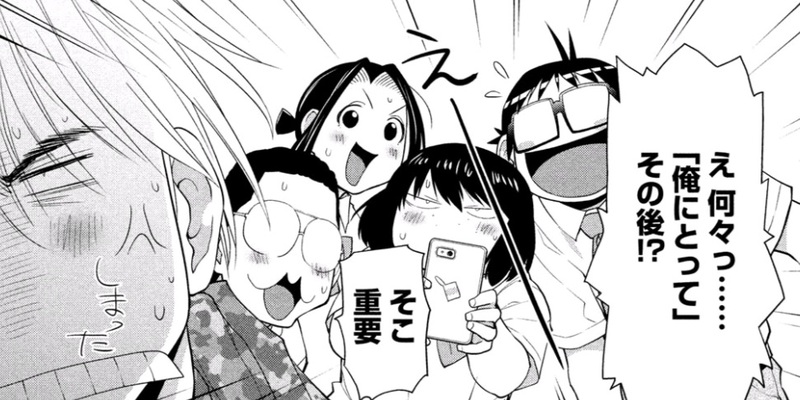 Even now, I find myself regarding Rokudo no Onna-tachi more highly than ever. 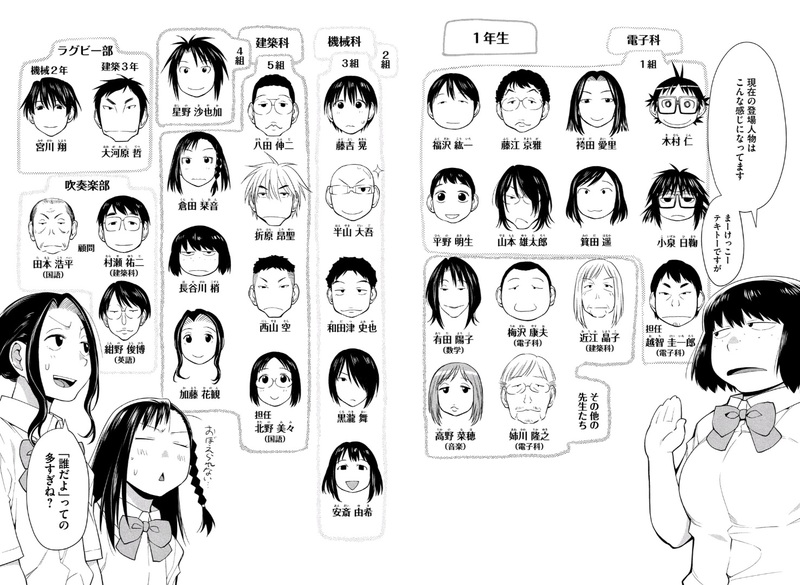 There are many aspects of this series that contribute to its success, but fundamental to all of it is the portrayal of its protagonist, Rokudou Tousuke, as a true underdog. In a sense, he’s the Krillin of the series, but Rokudou no Onna-tachi is a story where Krillin is the main character, and he succeeds because he’s not the strongest, or the toughest, or the smartest. 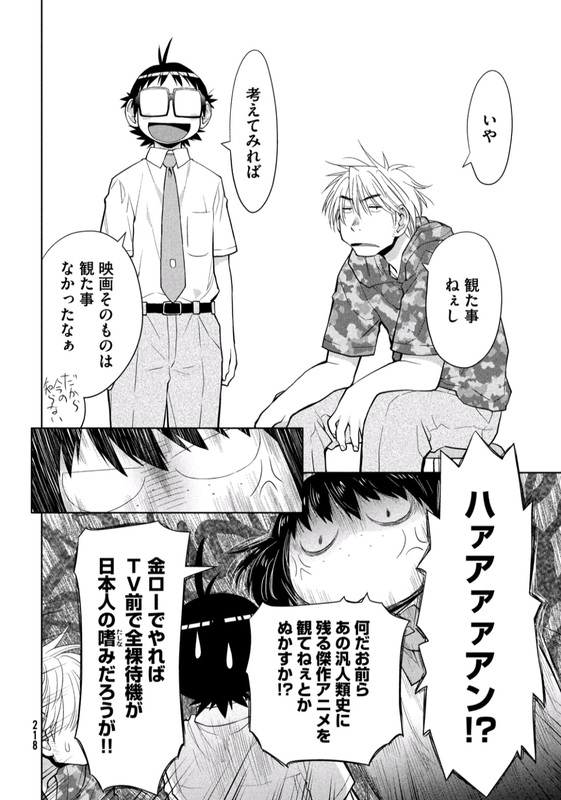 To recap, Rokudo no Onna-tachi is about Rokudou Tousuke, a meek high school kid who casts a spell on himself to be more popular with girls. However, what he didn’t know was that the spell was very specific: it only attracts delinquents and “bad girls.” Most notable among them is Himawari Ranna, the strongest and most terrifying brawler in town. It turns out that bullies are a lot friendlier when your ostensible girlfriend can shatter concrete with her fists, but Rokudou is the last person to want to encourage violence, so he actively tries to prevent Ranna from sending every person they meet to the hospital. Along the way, Rokudou manages to befriend an eclectic group of people and through a combination of friendship, guts, and kindness, accidentally becomes the “shadow boss” of his school. I call Rokudou no Onna-tachi a delinquent harem work, but it leans much more toward the former descriptor than the latter, and I think the series is all the better for it. 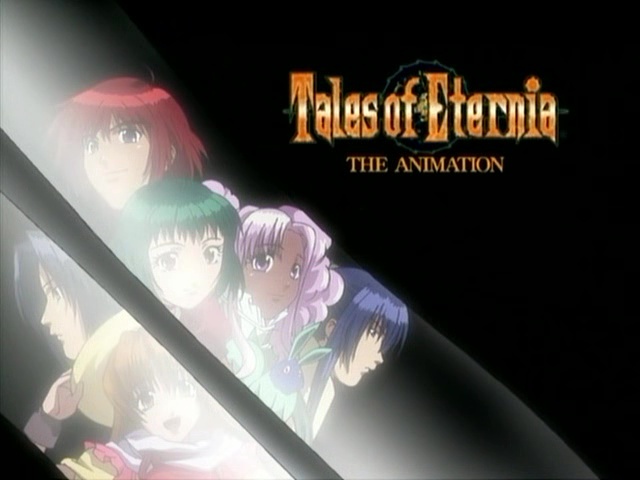 While there is a romantic aspect of sorts, as the series has progressed, a majority of the focus has been on Rokudou’s shounen protagonist-esque ability to win over his antagonizers with or without the attraction spell (which he can’t get rid of, no matter how hard he tries). And even when it comes to the delinquent girls who fall head over heels for him. What’s more, “being hot to bad girls” doesn’t give him much of a leg up in a fight, so his ability to stand up to bigger and bigger threats speaks more to his qualities as a human being than anything else. And yet, while romance doesn’t define the series, the central relationship between Rokudou and Ranna is still interesting and vitally important the tone of the narrative. If Rokudou is indeed a Krillin, that sort of makes Ranna the Android 18 of this story, in that she’s the more powerful of the two. 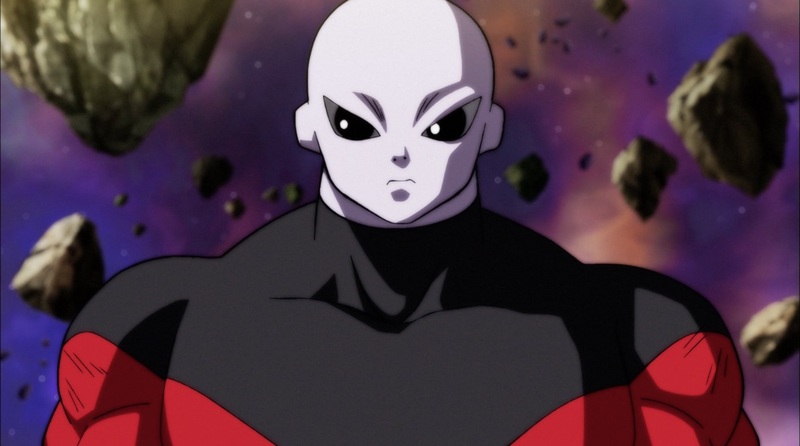 However, her role is arguably closer to that of Goku, or even Saitama in One Punch Man. She’s an unstoppable force in a fight, and many physical conflicts in Rokudo no Onna-tachi are a matter of anticipating the carnage to come as soon as she gets where she needs to be. She’s not a heroine with a tragic backstory or a brash amazon with a hidden soft side, and even those moments of loving infatuation toward Rokudou humorously highlight a central tenet of Ranna’s being: violence is everything. That dynamic of contrasting personalities between Rokudou and Ranna fuel both the comedic and the dramatic parts of the manga, and it’s all the better for it. 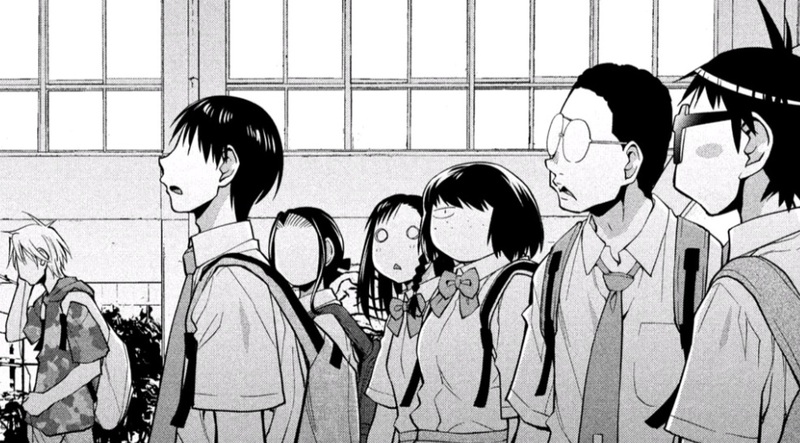 If Rokudou no Onna-tachi had just stuck to pure silliness, making jokes about how an endless parade of nasty girls were getting googly-eyed over a tiny loser, then it would have worn out its welcome far too quickly. But if it had swung too deep into the serious and dramatic, then I believe it would have had a harder time standing out from the pact. It’s because Rokudou can be portrayed as this unlikely hero, and that the series can swing between silly and serious so effectively by using his constantly being out of his depth, that the manga is such a rewarding and enjoyable experience. So I propose a different analogy: being privileged is like starting each round of a fighting game with a full super meter. Not everyone is familiar with fighting games, so this bears some explanation. Typically, when you start a match, both characters have full health, maybe somewhere between zero to 50% super meter, and placed at a neutral distance where neither has an automatic leg up on the other. Super meter is a gauge that, when sufficiently full, gives access to powerful moves that can aid players in various situations. A full super meter at the start of a round does not guarantee a win. It does not replace or remove the need for skill, hard work, or experience. It can be squandered to the point of being useless. Some players might end up perpetually unable to truly take advantage of it. However, even if it never gets explicitly utilized, the presence of that full super meter at the start of each round influences player and character interactions from top to bottom. Just by its existence, that meter affects how your opponent perceives you. If all you ever do is fight other people who also start with a full meter, you might never notice that there’s an issue. But as soon as you fight someone who doesn’t have this perk, the dynamics change. Imagine two players with the exact same talent and skill, playing the same character, but only one of them has that meter. The two should be able to do the same things, but one starting with more resources makes it so that what should be even exchanges are always potentially lopsided. The player with the super meter has access to additional options. That means not only does it let that player get out of tight spots they wouldn’t otherwise, and press advantages that they already have, but when only one person has that starting meter, a “neutral start” isn’t actually neutral. That’s the thing about privilege: it subtly affects how you are perceived in the world and what you are thought to be able to get away with. It doesn’t automatically mean those who are privileged have a leg up in every situation compared to those who aren’t, but its influence permeates aspects of life big and small without anyone even having to try. It’s why assuming that everyone is on a level playing field is the classic sign of someone who is privileged and unaware of it, but also why it can be so hard to grasp for those ignorant of its existence.